Zipangu Shochu Magazine, now in its third year, has tended to focus on the people and companies that make shochu, or at the very least are based in Japan (see last year’s feature article on Chef Marc Matsumoto). This is an obvious necessity since the publication’s mission is to spread shochu’s story far and wide, something that has yet to happen on any noteworthy scale. The amount of information available online in languages other than Japanese is still dismal, and the number of shochu proponents outside Japan is still disappointingly small. When compared to the wide world of saké, it’s painfully evident that significant resources must be poured into teaching the world about the shochu category. However, it’s important to note that there are indeed people out there that are promoting shochu in their own unique ways. There are dedicated professionals all across the globe using shochu in their bar programs or educating consumers about Japan’s best-kept secret. These people are positioned on the front lines of shochu’s introduction to underdeveloped markets. We’d like to take this opportunity to introduce you to some of the experts and aficionados that are working overtime to bring shochu to new audiences. 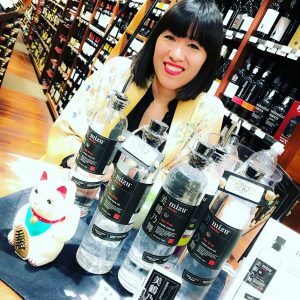 Ichioka is the world’s only certified shochu expert who is 100% Japanese-English bilingual and can boast extensive knowledge/experience in the US drinks sector. When it comes to the shochu market in New York City in particular, and the United States in general, few people have as much experience and knowledge as Taeko Ichioka. Ichioka is a certified Shochu Kikisakeshi (shochu expert), and she has spent a significant amount of time in Kyushu touring distilleries and guiding others who wish to learn more about the island’s various regions and myriad shochu brands. She has developed a keen understanding of consumer segments and trends in the American market, and she has a knack for explaining shochu to people on their own terms. She previously did sales for Mizunomai in New York City where she was responsible for finding new accounts while taking care of the relationships that Mizunomai already had in place. Mizunomai is a private brand that is made in Saga Prefecture and sold primarily in the United States. The company has grown considerably over the past couple of years, a time period that aligns perfectly with Ichioka’s tenure there. She was one of the main reasons why domestic sales increased 85% and global sales 65% during her time with the company. After completing her contract in New York City, Ichioka has relocated to Tokyo where she is currently working on various shochu-related projects and promotional activities. As one of the few shochu experts with true Japanese-English bilingual ability, it’s safe to say that she will remain one of the most sought-after shochu professionals in the world. Lyman works part of the distilling season every year at Yamato Zakura Shuzo in Kagoshima Prefecture. Stephen Lyman is a leading authority on all things shochu, and he draws his knowledge from the unique perspective of actually having made shochu in a traditional distillery. He has worked for the past half dozen years at Yamato Zakura in the northwestern part of Kagoshima Prefecture, and he currently calls Fukuoka home. His experience making shochu by hand is incredibly rare as there are only three distilleries left in Kagoshima that still make all of their shochu in this centuries-old and back-breaking style. He also teaches the SSA’s Shochu Advisor certification course in the United States, a qualification that he himself earned several years ago. Lyman lived in Manhattan until the fall of 2018 where he hosted regular shochu tastings and was named Cool Japan Ambassador for shochu by the Japanese Government. He is also the most prolific English-language writer in the world when it comes to the topic of shochu, and much of his commentary on the topic can be found on his website (kanpai.us). He is also one half of the consulting firm Honkaku, which assists distilleries and other businesses in their efforts to bring shochu to foreign markets. Since moving to Kyushu in September, Lyman has already put in another stint at Yamato Zakura, and he recently became a faculty member at Kyushu National University. He plans to continue promoting shochu through working with various distilleries and advising them on marketing, branding, and export strategies. -Follow Stephen Lyman on Twitter. -Follow Stephen Lyman on Instagram. Vera calls the shots at Tsunami Panhandle in San Francisco, a restaurant that boasts the best shochu and awamori list in California. San Francisco has a couple of bars that carry a modest collection of shochu and awamori products. However, until this year there was nothing to write home about. Now there is. Enter Tsunami Panhandle, a new fish-focused izakaya in the Mission run by Victoria Vera that puts shochu front and center. Vera recently fell headlong into the shochu rabbit hole, and she has taken it upon herself to source just about every shochu brand that is currently available in the western United States. And she even has some that aren’t. The menu is impressive. At more than 100 bottles, it’s safe to say that there isn’t a better shochu list anywhere in the city. Vera also made the pleasantly surprising decision to give shochu top billing on the menu. Tsunami Panhandle carries a lot of saké as well, but it plays second fiddle to the shochu list, and the decadently lit bar shelves are lined with shochu and awamori bottles. An order of any bottle of shochu will earn you a dozen oysters, and the food menu boasts fish from Tokyo’s famed Tsukiji Market. 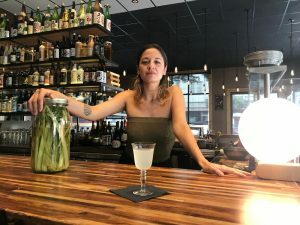 Vera has made ample use of social media to help promote her lounge-inspired location on Fulton Avenue, and her keen eye for design and photography has helped draw people in for a glass of shochu or three. The author (left) with Frank Cisneros after hours at Uchu. It didn’t take long for Uchu, one of the newest Japanese restaurants in New York City, to earn a Michelin Star. Less than a year in fact. 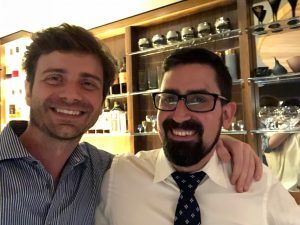 And a driving force behind that feat was none other than Frank Cisneros, the phenomenally talented bartender who has extensive experience both in the city and Japan. He spent many moons mixing cocktails at the Mandarin Oriental in downtown Tokyo, an experience he thanks for honing his efficiency and attention to detail behind the counter. He now conducts a cocktail omakase at Uchu in New York that has garnered rave reviews, and he routinely finds ways to incorporate shochu into his creations. “Shochu’s diversity of flavor and aroma are pretty much an untapped palette for cocktail creation. I think we’re going to see a lot more experimentation over the next few years,” he said. One of the keys to getting shochu into new markets is courting bartenders and beverage managers, roles both filled by Cisneros at Uchu. He enjoys being the one to seed shochu in consumers’ minds. 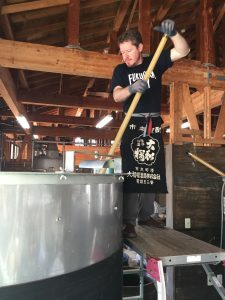 The stories he tells his guests and his passion for craft drinks are a true asset to the future growth of shochu in the United States and beyond. With only eight seats at his bar, Cisneros is a pro at creating bespoke tasting experiences for his guests. His knowledge of Japanese whisky, shochu, and awamori allows him to answer any and all questions that his guests have about Japanese spirits. All of the people profiled above came across shochu either during their nights out drinking in the United States, or during their time in Japan. However, we’d be remiss to suggest that the drink’s appeal is encountered only in those two nations. Shochu has covertly entered a surprising number of markets, often through spot sales, even if the total volume shipped currently remains underwhelming. Europe and other parts of Asia have proven especially receptive to shochu’s quality and breadth, so the future certainly appears to be bright. While shochu still lacks the name recognition that saké has made for itself, there are signs that awareness is slowly growing. The future of the category depends largely on the amount and quality of the information available to the public. The more experts and motivated ambassadors that can be created, the closer the category will get to reaching or exceeding saké’s level of near ubiquity. **This article originally appeared on The Kyushu Advantage website. It was reprinted with permission. Click here for the original article.